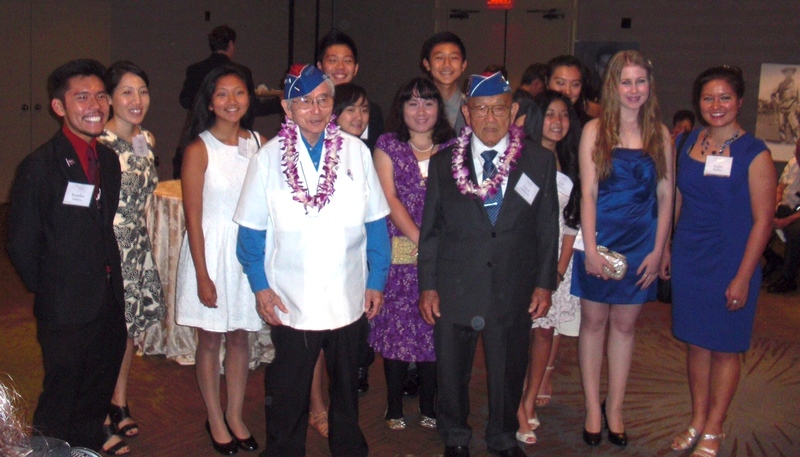 Essay/video contest winners with veterans Yoshio Nakamura and Toke Yoshihashi at Evening of Aloha on Sept. 19 at the Bonaventure Hotel. Go For Broke National Education Center announced the winners of its 2015 High School and College Student Essay and Video Contest at its annual Evening of Aloha gala last Saturday. Entrants represented 55 high schools and 20 colleges and universities. A total of $6,500 in prize money was awarded. GFBNEC also announced that Pacific Global Investment Management Company is once again the presenting sponsor of the contest. Their generous contribution is made in memory of long-time community philanthropists and business leaders Manabi Hirasaki (522nd Field Artillery Battalion, C Battery) and Sig Kagawa. The contest has also been made possible by two supporting sponsors: Ken and June Shimabukuro, and an anonymous donor in memory of Mas Takahashi (100th Infantry Battalion, C Company). “The 30 winning entries … share compelling aspects of the Nisei veteran story in very personal and profound ways. Congratulations to the many students who won and who shared their stories. Their essays and videos speak passionately about their admiration for the Nisei soldiers who made great sacrifices so those who followed would have a better life. Serving as judges were educators Nancy Sagawa, Mary Jane Fujimura, Ikuko Kiriyama, Naomi Jue and Barbara Lai, and community volunteer Audrey Ishimoto. Christian Saiki, Humboldt State University, Arcata, Calif.
Caitlin Chen, Irvington High School, Fremont, Calif. The winning essays will be published in The Rafu Shimpo.